Through 20 years of living far from the homeland, the nostalgia always wells up in the heart of painter Van Duong Thanh. 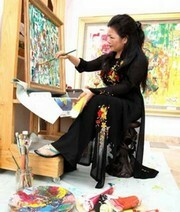 In recent years, she has returned to Vietnam many times to establish painting studios and hold exhibitions. Van Duong Thanh was born in Tuy Hoa, <?xml:namespace prefix = st1 ns = "urn:schemas-microsoft-com:office:smarttags" />Phu Yen Province and grew up in Hanoi. She started engaging in painting when she was very small and at the age of seven she was creating paintings for her father. Four years later, with her inborn aptitude for the painting, Van Duong Thanh was selected to study at the Hanoi Fine Arts College. She was taught by painter Diep Minh Chau and had many chances to meet with famous painters of Vietnam’s contemporary fine art, such as Bui Xuan Phai, Nguyen Tu Nghiem and Nguyen Sang. Since then, she accumulated a lot of valuable experiences which have followed her in the creation career. In 1988, she settled down in Sweden. She recalled: “At the college, I was taught basically under the curriculum of France . I learnt to paint every genre of paintings with an expressive, semi-abstract style with bright colours, quite different from the current training programme that focuses deeply on each kind of painting, such as oil, lacquer or water colour, etc. For that reason, the Swedish partner invited me to lecture painting for their lecturers and students”. After two years of learning Swedish language, she felt confident and taught the art of Oriental painting, even Western painting. She has become the first Asian female painter teaching fine arts in the Swedish language at Fine Arts Universities. She has taught many generations of students in Sweden and a group of fans of her paintings who established a fine arts association called Thanh-Gruppen. With more than 1,000 paintings, featuring Vietnamese people and the beauty of nature, she has held about 60 small and large exhibitions, leaving long-lasting impressions on the art lovers. Many of her paintings have been displayed at big museums worldwide, such as the National Fine Arts Museum in Singapore, Town Hall of Sweden, etc. Although the working and living condition in Sweden is very favourable, Van Duong Thanh never forgets her homeland. It is a constant source of inspiration, either from memory or direct observation, and its presence is utterly apparent in her work. Late painter Trong Kiem once said: “Whatever Van Duong Thanh painted, viewers can recognise the Vietnamese spirit, soul and the beauty of nature because she uses tranquil oils and lacquers to explore every corner of the country. Seeing Van Duong Thanh’s paintings, one can see familiar images and colours in the daily life, such as women going to transplant rice, weaving non (conical hat), bathing under the moonlight, children going fishing, villagers in the midland, moss-covered roofs, banana leaves nearby rows of flowers, old gates, etc. All open a mysterious world. Even though she uses pure or contrasting colours, her paintings still reveal the harmony thanks to the light and skilful brush strokes. In her recent returns to Vietnam, she always wishes to bequeath her talents and experiences to the Vietnamese young generation. In 2007, thanks to her contributions to the art and efforts to strengthen the relationship between Vietnam and Sweden, Van Duong Thanh was awarded the title “Glorious Vietnam 2006” at Van Mieu-Quoc Tu Giam (Temple of Literature – First National University). She has been renowned both domestically and internationally as a messenger of peace with a friendly smile, gentle beauty and free soul. Through her works, she has introduced the country and people of Vietnam to international friends. - Van Duong Thanh is the youngest painter whose painting entitled “White daisy” has been bought for display at the Vietnam Fine Arts Museum, which she painted at the age of 20. - She won the Vietnam Fine Arts Association’s prizes in 1972, 1974 and 1975. - Her two works “Vietnam’s ancient village” and “The quietness” were selected by French and American juries as the best paintings at the “Preeminent International Art Programme” in 1975 and 1977 which attracted artists from 36 countries. - She has painted over 1,500 paintings, including 15 works displayed at the Vietnam Fines Arts Museum, 5 works at Singapore’s National Fines Arts Museum and 15 works at museums and the Town Hall of Sweden. - She has held about 60 exhibitions in many countries in the world, such as France, the US, Sweden, Hong Kong, Singapore, Germany, etc.